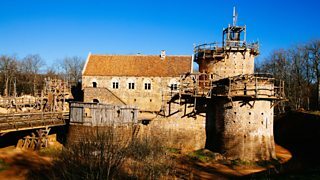 BBC Two - Secrets of the Castle with Ruth, Peter and Tom - How do you build a medieval castle from scratch? How do you build a medieval castle from scratch? 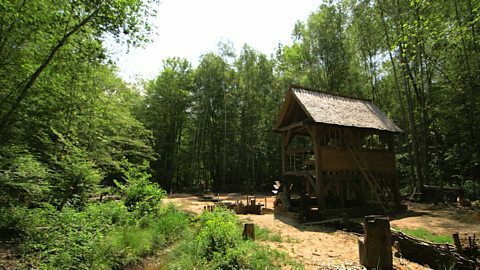 Guédelon is the world’s biggest experimental archaeological site – and some would say the most ambitious too. 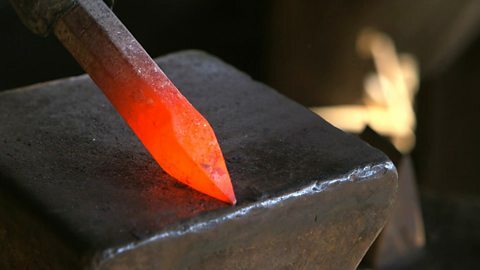 Since first breaking the ground in 1997 the workforce have used the tools and techniques of the 13th century to unravel the mysteries of medieval construction. And since they are resurrecting the crafts and methods of an age before mechanization, it’s all been done by hand. Which, in turn, means that everything is dependent on the skills of the workforce – a small army of stonemasons, blacksmiths, carpenters, wood-cutters, tilers, rope-makers and dyers who hand-craft every component on site. As they arrive and assemble in the morning they don’t just greet each other with a glib “hello”. Everyone seems to greet each other with a firm handshake or a peck on the cheek. And they depart in the same manner at the end of the day. And they routinely share beers or bottles of wine on site after changing out of their dusty work clothes before going home. But then again, this project wouldn’t work unless the workforce had a close bond of mutual respect, because they are totally reliant upon each other to get anything done. Peter join’s the castle’s resident blacksmith while Ruth gets on with the dishes.. If a door needs making the carpenters prepare it, but they need the blacksmiths to forge nails, brackets and hinges. But all their work will be in vain if the masons have not measured out the hinge slots and the doorway itself accurately. If anything goes awry with the stonework, the door won’t fit. The stonemasons depend on the carpenters to provide all their scaffolding, the treadmills that hoist stones to the tops of walls, even the buckets they need mix their mortar. And templates for the complex geometry involved in cutting stone accurately are all made of wood. The carpenters, in turn, rely on the wood-cutters who go out into the abundant forests surrounding the castle to chop down trees when timber is required. And everybody relies upon the unsung rope-makers who produce the many miles of rope needed weekly to bind and hoist loads – whether they be stone, wood or metal. Ropes were also twisted into thick braids and used to protect stones while they were being dressed. The rope maker supplies the site with hemp and ﬂax ropes, of varying lengths and thicknesses. To make a rope, yarns are ﬁxed to the hooks on a jack, and, at the other end of the ropewalk, to a wooden traveller. The rope maker then cranks the jack’s handle: he thus produces four strands, one per hook. As the yarns twist into strands, they pull the traveller towards the jack. Finally, the rope maker splices the rope. Tom and Peter use a waterwheel to do the hard work for them. They work with the ethos that the surest way of re-discovering lost techniques and methods to by discovering first hand what works and what does not. Archaeologists and academics flock to the castle to see their theories tried out and put into practice. Above all, building a medieval castle requires the skill and co-operation of a workforce functioning together as a community. Secrets of the Castle proved very different from anything we have done before. For a start it is our first venture overseas. It is also the furthest back in time that we have cast our net, being set in the 1300s – roughly the year 1246… around tea-time. But the biggest difference has been that all the projects we have embarked on in the Castle series were already happening before we got there. In our previous adventures we have been blessed with some magnificent locations – such as Manor Farm in Hampshire, Morwellham Quay in Devon and Acton Scott in Shropshire – but most of the projects we undertook to recreate the life of the era were devised and undertaken by the production team and presenters. At Guédelon we scarcely had to devise any projects at all. Instead we joined in with the work constantly taking place around us. This is because Guédelon is a “work in progress”. View How do you build a medieval castle from scratch?